My hair is in rollers. Like… kickin’ it old school in Velcro rollers. No one needs to know that besides the 137 of you who read this blog, my cat, and any random person who comes to this blog after Google searching “the most awesome biscuits ever made, for real”. Ah.. the rollers. It’s amazing how un-cute you have to look to eventually look cute-ish. Boys don’t do this. They just put on cardigans and look hot. Now… there’s a lot of good news I need to tell you about these biscuits. First: bacon. Second: brown sugar. Third: butter. Fourth: they’re freaking biscuits!!! And fifth: they do not have an un-cute phase. They’re all cute/delicious/freak-out-worthy, from beginning to end. Do you really need convincing? No. Do I really need these rollers? Um… today? Yes. I love when baked goods start with salty bacon and brown sugar. It’s really a good path. Cold butter is the key to big, fluffy biscuits. It gets incorporated into the dough with fast fingers. 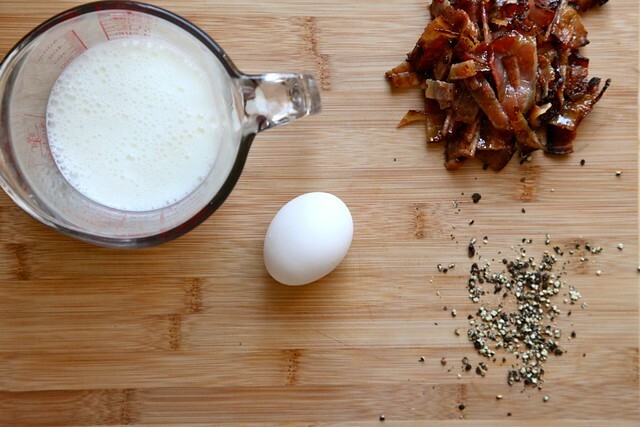 Sweet and salty bacon is paired with very coarsely crushed black pepper. Every day needs a bite of spice! Just mix biscuits with a fork… no biggie. Try not to sneak all of the bacon bits out of the dough and into your mouth. I could just stare at this picture all day. It’s like being in love. 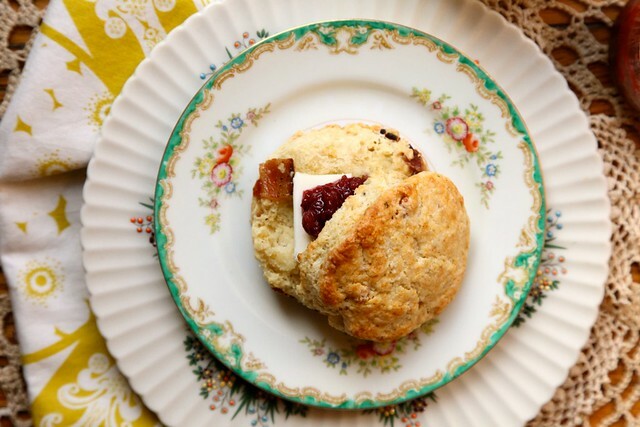 These biscuits… besides being completely delicious… are smack dab in the middle of sweet and savory. You could top them with butter and jam, and feel just right. Or! You could add a fried egg and tomato jam and have a perfectly tasty morning. It’s up to you. Choose your own bacon biscuit adventure! Place a rack in the center of the oven and preheat oven to 375 degrees F. Line a baking sheet with foil or parchment paper and spread bacon across baking sheet in a single layer. Sprinkle with brown sugar and black pepper. Bake until crisp and cooked through, about 13 to 15 minutes. Remove from the oven and carefully use tongs to place the hot bacon on a cutting board. Don’t put the bacon on paper towels or they might stick. Ick! Allow to cool until you’re able to handle the slices and chop into medium chunks. Set aside. Increase oven temperature to 425 degrees F. Line another baking sheet with parchment paper or foil, and set aside. In a mixing bowl, sift together flour, sugars, baking powder, baking soda, salt, and black pepper. Add cold butter and use your hands to quickly break the butter into the flour until mixture resembles coarse meal. In another bowl, combine egg and buttermilk and beat lightly with a fork. Add to flour mixture all at once, stirring to incorporate. Once batter is nearly incorporated, add bacon and mix in. You may want to dump the shaggy biscuit mixture onto a lightly floured board to knead together a few times. Don’t overwork the dough and melt the butter, Just make sure it comes together. Roll or pat dough into a 1-inch thickness. Cut into 2-inch rounds using a biscuit cutter or cut into 2×2-inch squares. 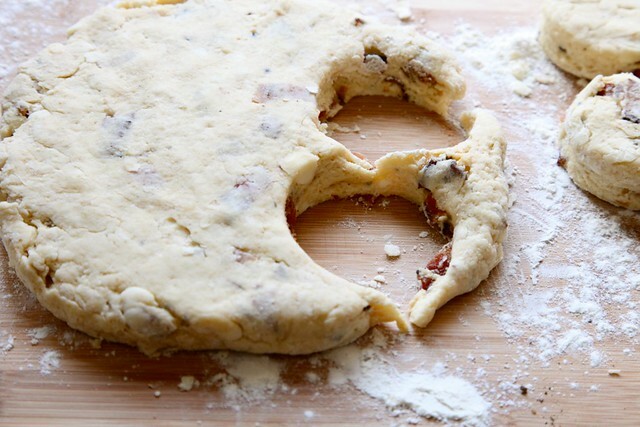 Reshape and roll dough to create more biscuits with excess scraps. Place on an ungreased baking sheet and bake at 425 degrees F for 12-15 minutes. 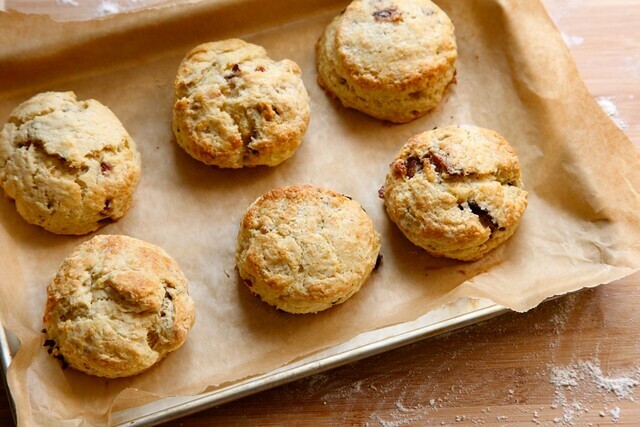 Serve biscuits warm with jam or a fried egg. I love these biscuits the day they are made. They can be kept in the fridge and will last for two days. The shaped, uncooked biscuit can also be frozen. Thaw in the fridge overnight and bake up in the morning. I dont eat bacon but I do love brown sugar. Brilliant! The other day I was actually pondering what could go in a biscuit besides cheese. I’m adding this to the list. Hint: maple syrup instead of brown sugar. Oh yes. They look soooo good. I think I might have to make some today as it’s a rainy, horrible day outside and I don’t want to go out. Oh. My. Goodness. 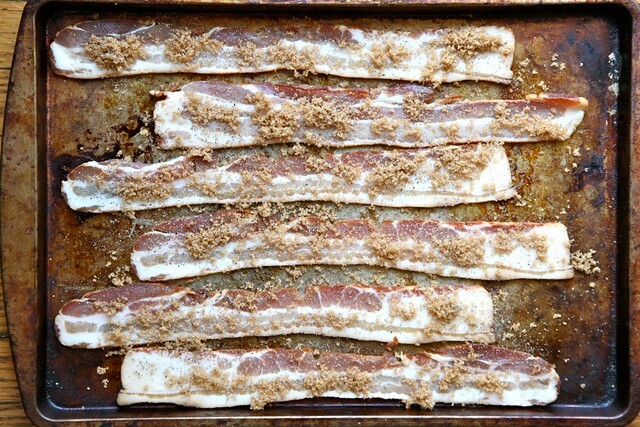 Looking at those bacons covered with brown sugar has just made me swoon. SWOON. These are genius. If there is a Nobel Prize for Baking you would have it in the bag. Genius, that’s all I can say. Joy. You are the devil. 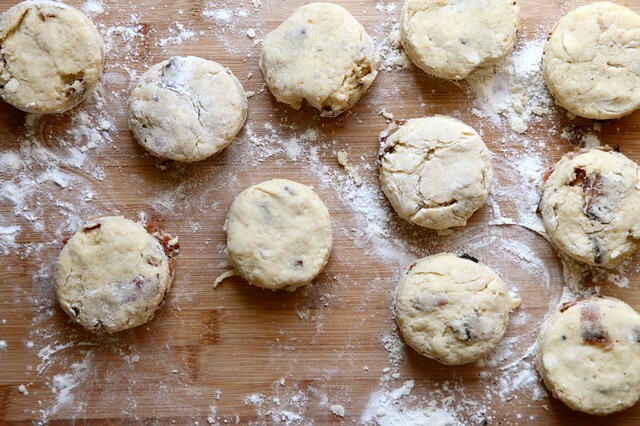 Happy Friday, and here’s to weekend biscuit making. xo. Now I am new to your blog and I have to say that you are adorable. Your recipes are pretty damn delicious and your writing is very sweet. Long may it continue! Amazing! 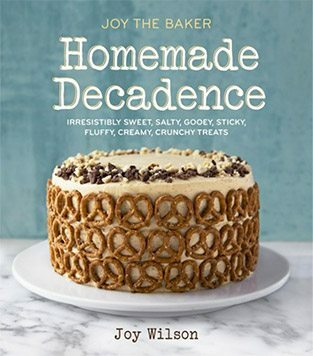 Congratulations Joy wonderful blog, recipes, posts… everything! Thumbs up! Also, I’m pretty sure you don’t need rollers to look cute… so only do it if you’re having fun! I just ate a bowl of yoghurt and Granola for breakfast. Then I saw your post. I want to eat one of these biscuits with breakfast, lunch and dinner! Holy Bacon! That shot of the bacon ready to go into the oven? Swoon! These sound amazing Joy, can’t wait to try them out this weekend!